So now that I know you're reading, how to start? 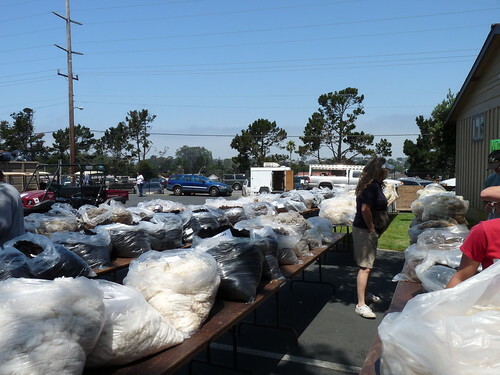 The obvious... yesterday I attended the Monterey Wool Auction with Heather and Ayse. I really shouldn't have gone... 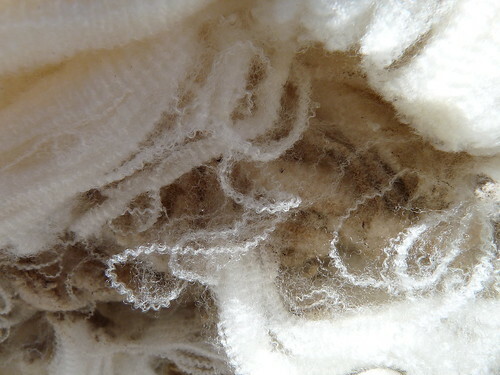 I have several (seriously, several) fleeces I've purchased here at home in the past months, and even though I already dedicated a whole month to washing many, I still have more unscoured wool than I can reasonably handle scouring before the year is over. 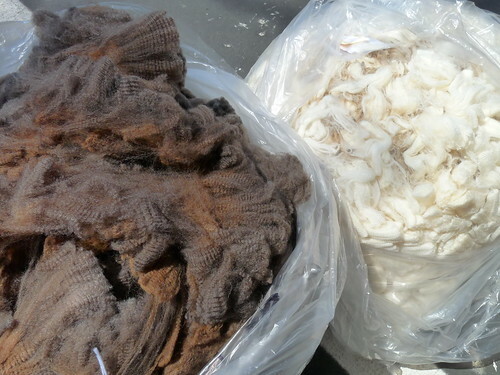 But really, after seeing all of the fleeces being judged and then all lined up in the lovely sun, who can blame me? I also was the high bidder for her flockmate, "Hollyberry," a true mutt (cormo/corrie dad and corrie/romney x finn/dorset/targhee mom... sounds like me and mine :)) with a 5" staple and a nice bold medium crimp. I'm thinking it will be a good match for Ysolda's new Vine Yoke cardigan? I saw the new twist collective before going to the auction and immediately thought the color was spot on to the sample. 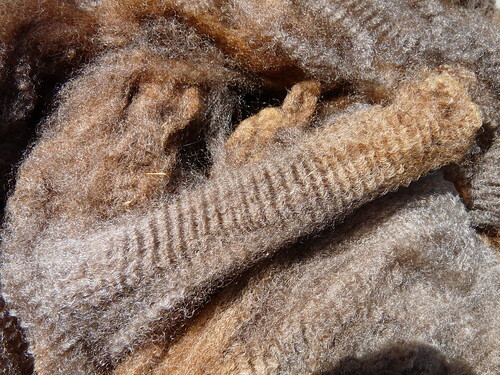 I didn't notice "Hollyberry" at the judging (she did not place highly in her category, solid other than black, 3/8 blood combing 56s-58s)... but her color glowed in the sun as I blushed, pretending to take a second look at fleeces recovering from the surprise. She imprinted on me while we talked, my souvenir of your words and the day. I always enjoy the "surprise" of banded/multicolored staples once washed and combed... will it be greybrown or browngrey? Purple? Aside from Chloe, I only had one other YES PLEASE! 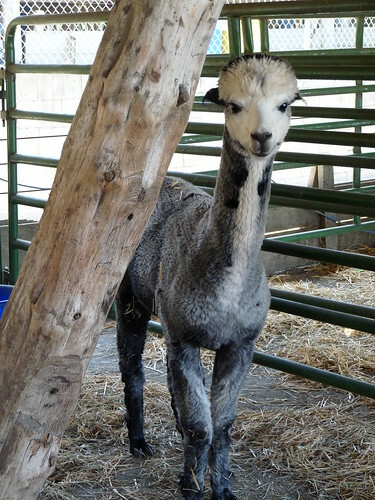 fleece on my judging notes-- a heavy steel grey corriexrambo from Nancy Burns at Marble Peaks Ranch. She is the shepherd who raised Kali, the true black I purchased last year at the auction and featured in my English combs post. Nancy raises true black to fading grey corriedale and corriedale x rambouillet crosses that have excellent crimp and retain that lock formation I love. This year her black-black fleece won the Champion Natural Colored category, beating out Sue Reuser's cormo. I passed on the grey since it was on Jasmin's bidding list (save me if I came up against her bidding card ;))... and because I've already reserved a grey from Nancy for 2010. I usually write to the shepherds after buying their fleeces from shows-- they usually appreciate reactions to the day (they don't know how well their fleeces place, what judges had to say about them, etc.) and the more I talk to them, the more I feel like I want to buy from them directly as opposed to at auction. I know Nancy via email and we'd been talking about me buying a 2010 fleece-- so I was able to secure one and didn't feel pressured to bid. (Goodness knows I didn't need to bring another home RIGHT AWAY.) Merry Meadows said the same when I wrote to them, reminding me their fleeces are generally priced at $16/lb (I paid over that for both) and to contact them when I want more. On the flip side, I know that shepherds send their best to auction since they will receive the highest price the market will bear (as well as a coveted ribbon with premium monies), while only paying the entry fee ($2 + 4.5% of sales price) and shipping there... as someone who truly wants to support their industry I want to contribute to getting the best prices for their fleeces so they continue to offer them. So of course I'll go again, how else will I see you and flirt with such loves? Wow, sounds like alot of fun! I'm drooling over the pictures! Wow, it sounds like such a fun, interesting day! omg. that furry cuteness at the end was too much!!! and the crimp? the CRIMP?!!! Amazing. 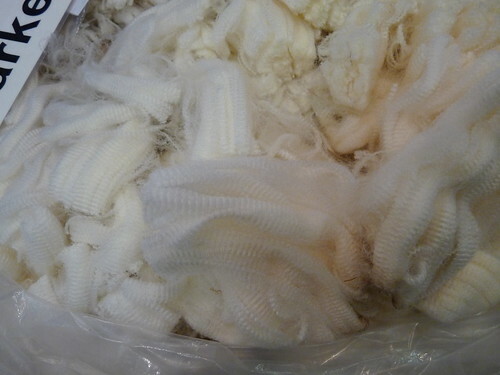 can't wait to see what you do with these wonderful fleeces! Yay, I'm glad you had fun! I was going to turn down the offer of some of that fleece, but now that I see it close up, I may need to reconsider... they're GORGEOUS! Nicely done! Once again you have given me the chills looking at your amazing fleeces:) Almost makes me want to switch to wool instead of alpaca fleece. I love the picture at the end; awesome! The crimp on the locks is amazing, too! I don't blame you for bringing either one home. Still reading. . . Where do we start? Wish I would have known you were in Monterey way back when.